1. How long have you been an artist? Like most artists, I've been drawing all my life. About 13 years ago I began thinking of art as a career after studying at the Art Institute. From there I worked for various companies and did freelance work on the side. When I got laid off 2 years ago, I decided to make the leap and become a freelance illustrator. It's a wonderful, fantastic and scary challenge but so far I'm loving it. 2. What mediums do you work in? When I first started I did mostly pencil and ink. Now I work with CorelDraw primarily because I like the look of vector and vexel images. It's also extremely versatile and I've been able to develop a pretty unique style that I really groove on. I love using modern tools to create Art Nouveau pieces - it's like the ultimate marriage. 3. How did you first hear about steampunk and what was your first reaction? I heard about Steampunk about two years ago while at DragonCon. My band was performing there for the first time and I kept seeing all of these "retro sci-fi-type" costumes. I thought the concept was just the about the coolest thing I ever saw and I was drawn to it. My band-mate, Jen and her boyfriend told me a bit about it and I started researching steampunk as soon as I got back home. I was so completely enthralled by the idea of it that I immediately began thinking of ways that I could get involved. 4. 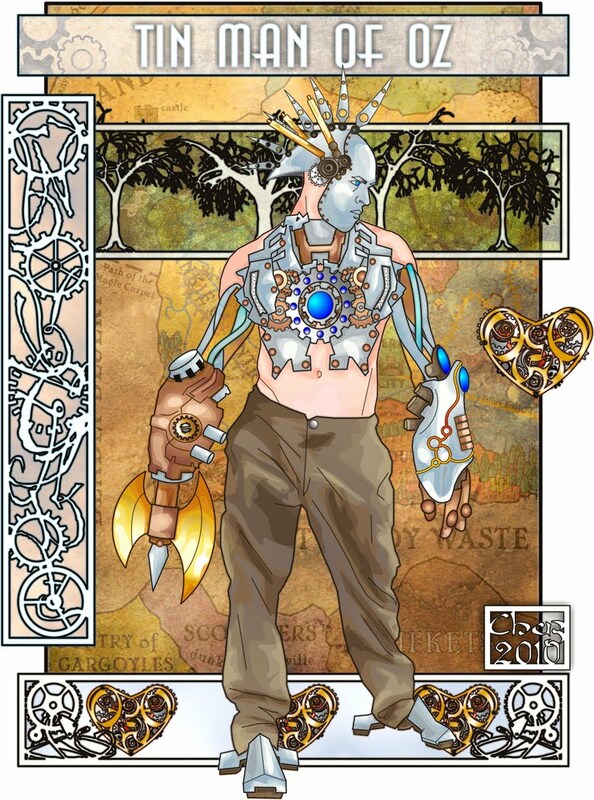 Your latest works are steampunk inspired, where does that inspiration come from? Well, I've always loved the idea of spies and agents working for some secret organization trying to save the world from dastardly threats and unimaginable conspiracies. Movies like, "League of Extraordinary Gentleman" & "Hellboy" also served to fuel the creative process. In thinking along those lines, I began to think up various characters that would be members of that organization. 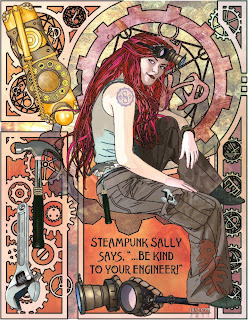 So I came up with the name, "Sargas Prime" and then Steampunk Sally was born. At some point I'm going to completely flesh out the concept and do more illustrations. 5. What is the steampunk scene like where you are from? It's getting better and better every year here in Colorado. This is fantastic because we have a lot of steampunk fans! 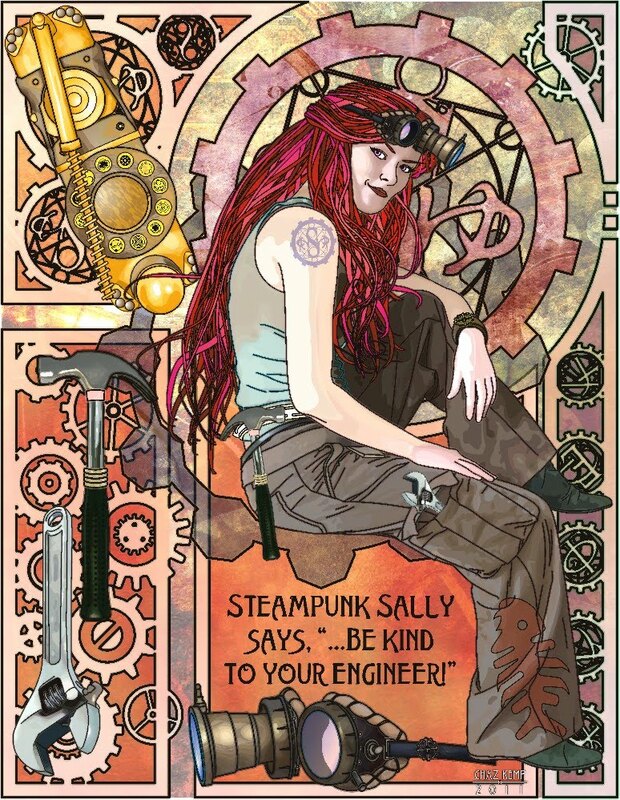 (Colorado Steampunks Facebook page has over 800 members!) 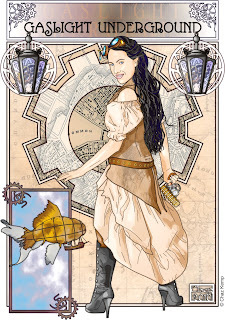 We have our first ever steampunk convention called Anomaly Con coming up March 26th & 27th. I'm also doing a ton of art for a fantastic LARP called, "Gaslight Underground" premiering in just a few months after the initial play-testing is done. So ya, we Coloradoan's are always a little late getting to the party but once we arrive, hold on to your petticoats! 6. Do you have a character or costume? Of course! My character name is Captain Haji ShadowCat, airship pilot and dagger-wielding adventurer for Sargas Prime. He's a Fae prince from the land called, the Dreaming and he's having way too much fun in the mortal realms to leave just yet. He fights side-by-side with his nixie lover, Abigail, and together they wreak havok on evil-doers everywhere using steam-powered tech, their wits and maybe just a teensy bit of magic. Thank you so very much for featuring me in your awesome blog! Your questions were very cool and I enjoyed the interview a lot. I am quite honored and I look forward to being able to return the favor! Word Origins, The Spectra Nova?